Sarah Culberson was adopted one year after her birth by a loving, white, West Virginian couple and was raised in the United States with little knowledge of her ancestry. Though raised in a loving family, Sarah wanted to know more about the birth parents that had given her up. In 2004, she hired a private investigator to track down her biological father. 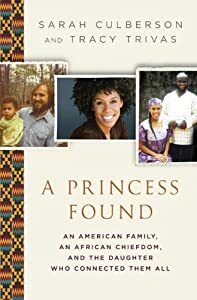 When she began her search, she never imagined what she would discover or where that information would lead her: she was related to African royalty, a ruling Mende family in Sierra Leone and that she is considered a mahaloi, the child of a Paramount Chief, with the status like a princess. What followed was an unforgettably emotional journey of discovery of herself, a father she never knew, and the spirit of a war-torn nation. A Princess Found is a powerful, intimate revelation of her quest across the world to learn of the chiefdom she could one day call her own. After connecting with her African family, Sarah Culbertson and her friend John Woehrle started The Kposowa Foundation - Rebuilding Bumpe High School. Please visit www.bumpefund.org for more information.